Dog owners rely on general practice veterinarians to help maintain their pet’s overall health and well-being. Some conditions, however, require specialized care that falls outside the scope of what general practice veterinarians can provide. In these cases, specialists must be consulted. A veterinary specialist is a veterinarian who has completed additional training and passed an evaluatory examination in a specific area of veterinary medicine. Just like ophthalmologists who treat humans, veterinary ophthalmologists specialize in the diagnosis and treatment of conditions involving the eyes and associated structures. A variety of eye diseases are common among dogs, and many lead to discomfort and vision impairment or loss. According to Martin Coster, DVM, MS, DACVO, staff ophthalmologist at Angell Animal Medical Center in Boston, “the most common diseases we see in the canine eye are dry eye, cataracts, and glaucoma.” Some ocular conditions are thought to have a genetic origin whereas others occur with age or exposure to environmental conditions and can affect all dogs during their lifespan. Many dog breeds have specific predispositions to various diseases. 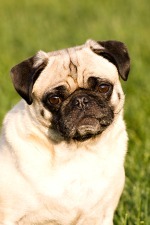 For example, flat-faced, or brachycephalic, breeds such as Pugs, Shih Tzus, and Bulldogs commonly suffer from corneal exposure as well as corneal dystrophies that can cause discomfort and vision loss. Likewise, dogs with long hair on and around their faces, such as Sheepdogs, Poodles, and Maltese can be more at risk of eye infection and irritation. The canine lifestyle also inclines dogs to injuries and infections. As such, dogs also commonly suffer from trauma-based ocular disease such as corneal ulcers and injuries to the eye. Dogs’ eyes are nearly identical in design and function to humans’ eyes. Therefore dogs and humans develop many of the same age-related changes. Chief among them are cataracts. 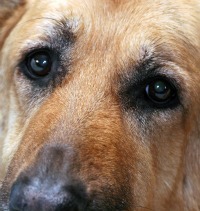 Dogs typically exhibit a number of signs when they are experiencing eye trouble. These changes may be physical, behavioral, or both. “Many eye problems start with a ‘red eye.’ You may also note a color change across the surface of the eye or within the eye,” Dr. Coster says. “There may also be an increase in tearing, squinting, and rubbing at the eye, face, or head.” Excessive blinking, cloudiness, and discharge, particularly that which is thick and opaque, can also be a sign of eye disease. While these signs indicate a problem, they can signal many eye ailments ranging from minor to severe. These can include anything from the presence of a foreign body to a number of serious diseases such as corneal ulcers or glaucoma. If not treated immediately, these diseases can result in permanent blindness. Some diseases, such as glaucoma, can progress very quickly. In some cases, vision loss can occur within days. “Unlike humans where most glaucoma is slow to progress, dogs develop closed angle or congestive glaucoma and the disease progresses rapidly over days,” Dr. English says. “But when caught early, therapy can resolve the pain and preserve vision in many dogs.” Conversely, some eye diseases have minimal initial effect on a dog’s overall function. For example, “loss of vision, when it affects only one eye and is the only symptom, is very difficult for the owner to detect,” Dr. Cook says. “Dogs compensate very well if they have some remaining vision.” Thus prompt veterinary examination is imperative in order to successfully diagnose and treat eye changes and help maintain dogs’ vision. There are measures owners can take if they suspect their pet is experiencing eye problems. “The most important preventative step,” Dr. Coster says, “is periodic examinations by your veterinarian, annually or as often as recommended for specific conditions.” When necessary, family veterinarians refer clients to board-certified veterinary ophthalmologists. The American College of Veterinary Ophthalmologists also maintains a list online at acvo.org. Eye disease can have painful and irreparable effects on dogs’ health and quality of life. However, virtually all eye conditions are treatable with a high rate of success if they are diagnosed early. Therefore careful observation, routine veterinary evaluation, and prompt attention to changes are the keys to maintaining canine vision and comfort.